In the context of Delusion, shifting to a more personal level Anderson recollects. “Why are there so many animals on the ceiling?” her dying mother asks. “What are the last things we say, the last words we say when we die?” “When my mother died, she was talking to the animals,” Anderson tells her audience. Haunting, plaintive music emotes from a synthesizer, albeit, altered, as a cello moans. “Dreams, places she always wanted to go...She (her mother) tries again. It’s been a privilege, an experiment, an honour to be part of this family...” Perhaps, for some of her American listeners, mother is a metaphor for the dying democracy which is our motherland. “Thank you so much, for having me,” Anderson quotes. But it is hard to tell whether that is something Anderson’s mother said or something she has said to her mother. Strings search for meaning. They move like wind, sometimes searing and restless, though flexible and light. Lightning strikes and I remember religious movies our Catholic school class were made to see as children, at Easter. But this is not the end. In Anderson’s work, themes resurface. Dreams begin to emerge, one of which features Anderson alone in a roomful of clothes she wore as a child. A pair of overalls with mud on them – “like something a farmer would wear, when there were still farmers and, farms.” She moves through diary entries in October of an unspecified year. Some people propose to preserve her body of work in plants. This makes good business sense to her, so she agrees. The past is present. The same reflective ‘mother’ music is heard again, as Anderson speaks of “a cloud the size and shape of Manhattan hanging over Manhattan”, and “an island where she used to hide things as a child” which is now underwater, “with only the tops of the tallest trees” visible. Her violin cries with sad Celtic overtones, as it swells and blends with buoyant didgeridoo like instrumentation. It is a blending of cultures, of colours. Well placed sounds and imagery such as a vintage B & W clip of rapidly typing hands moving across the keys of an old manual typewriter with accompanying sound fills an interlude leading into Anderson’s reminiscences of a trip to Iceland and the déjà-vu experienced there, as she traces her meandering family tree, taking some winding stream of consciousness side-trips as she travels. Tears metaphorically fall from her eyes, from her left, “because I love you,” from her right, “because I cannot.” Is she still speaking of her mother? Lightening sounds as one ‘season’ shifts into another. My mind wonders. Will younger generations lose the changing of the seasons? The music descends downward, into a deeper realm. But things are looking further up, to the moon. NASA, it seems, has been working on a plan to move the earth’s manufacturing and toxic waste to the moon. But there’s a catch. “Who owns the moon?” China says it’s theirs, Russia went there first, the US had the first guys there, the Italians claim to have seen it first. But Nikolai Fedorovich Fedorov started the Russians on a space plan some 150 years ago, via his philosophy, ‘the common task’, which stated that ‘death is mankind’s greatest problem’. But it is, according to Fedorov, a problem which could be solved, if only the bodies of our ancestors could be resurrected from ‘particles, floating in space’, etc. “Who are these people?” Anderson asks. If anyone would know, she might, as in 2003, she became NASA’s first ever, and so far, only, artist in residence. Anderson slips back into the voice of her masculine alter ego, ‘historian and social commentator’ Fenway Bergamot (named by Lou Reed) as she delves further into notions of the afterlife. Although what she says seems intriguing, some of it is indecipherable, possibly because of the problems such a swiftly morphing show presents for soundmen. Bergamot, her “audio-drag” filter, was assumed for a William S. Burroughs event Anderson hosted as master of ceremony in 1978, at which time she thought it might be fun to sound like a “distracted old coot.” Eventually, Bergamot became a “voice of authority”, but, as she said during a Q & A at the 2010 Vancouver Cultural Olympiad in relation to his voice: “now it doesn’t have too much authority left.” That said, if there is one thing I would change about Delusion, it would be for Anderson to lessen her use of Bergamot. Although ‘he’ comes out with some interesting facts and points of view, during his second appearance in the show, he tended to ramble, causing the audience to shift, though that is possibly her point, as she also, as herself, mentioned the male tendency to try to ‘fix’ whatever’s wrong. However, from where I was sitting, completely surrounded by women, it seemed her moments as ‘herself’ were the most intriguing. Though I do appreciate Anderson’s sense of experimentation, and judging by the supportive audience response at the end of Delusion, I’m not alone. But, no one could dispute her reference in Bergamot’s voice to the fact that corporations have the same rights as people in America, a fateful Supreme Court ruling known as the Santa Clara Decision (1886) which established an unjust state of affairs that the US, and subsequently, nations seeking Americanization, allegedly for the good of their people, have, sadly, never looked back, or recovered from. This phenomenon, if you could call it that, is one other US commentators like Noam Chomsky and Michael Moore also address. The most thrilling moments in this show come when Anderson is doing her involving story telling based on her own life, though she has also been known to seamlessly intertwine fact and fabrication as well. During the course of this sometimes shadowy show she also seems to evoke every type of feminine persona from mother-goddess to vulnerable child without a whisper of makeup or costume change, as her elfin form moves softly across the stage. Visually, an absolutely stunning sequence, in which projected, torrential rain ‘pours’ behind and all around her as she performs held the audience spellbound. 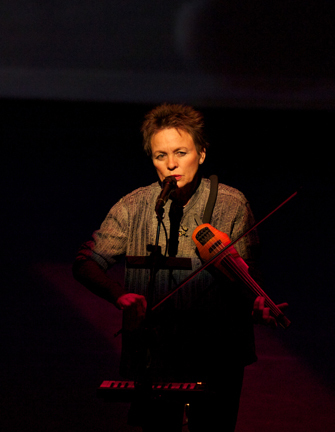 To top it all off, Anderson’s compositional skills have over the years, been honed to the point that she now seems to be on the verge of entering a new phase in her career in which the audience will, invariably, focus more than ever on her words and, music, and the way she and her fellow musicians, in this case, a sax and violin player silhouetted on screens, play it. Anderson, born in 1947, speaks like a true American baby boomer, simultaneously cryptic and kitsch, alternating between dark humour and chilling revelations which are just as startling for their pared-back honesty, about everything from her own feelings to the state of the world, as they are for what they reveal or, claim to. As always, with Delusion, Anderson’s artistic approach is uniquely her own. It’s an odd state of affairs to say the least that after hearing Anderson speaking about Iceland, we learned its volcanic ash would be stopping all US bound flights until her run is through on Saturday. 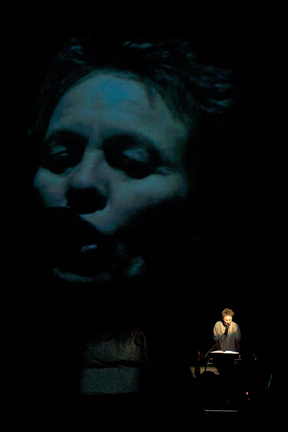 Call it coincidence....Just one of many reasons why we keep going back to see Laurie Anderson again and again. When we watch her perform, the sense of mysterious pleasure she gives is really, all ours.